Get instant insight into your KPI's and resources. Resource dashboard (extension for Resource Management plugin) brings an ultimate visual overview of all your resources on a one-page dashboard. Ultimate visual overview of all your resources on one-page dashboard. Take just one look on this dashboard and get instant insight about your company/project KPI's and resources. Explore Resource Dashboard plugin in Easy Redmine 2018 free trial. Easy Redmine 2018 is a complete and extensible Redmine upgrade. 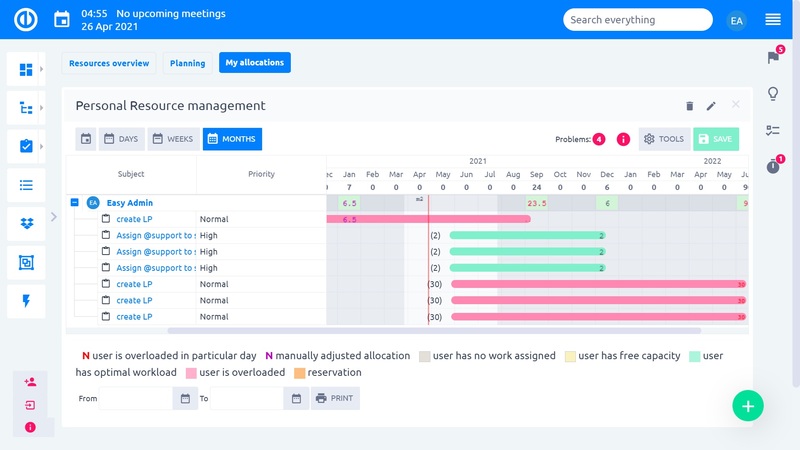 Combination of new mobile design with useful plugins & features will make you enjoy your project management, improve communication & user experience and save your time. It is extensible with plugins for Resource, Agile, Finance, CRM, Help Desk and more. 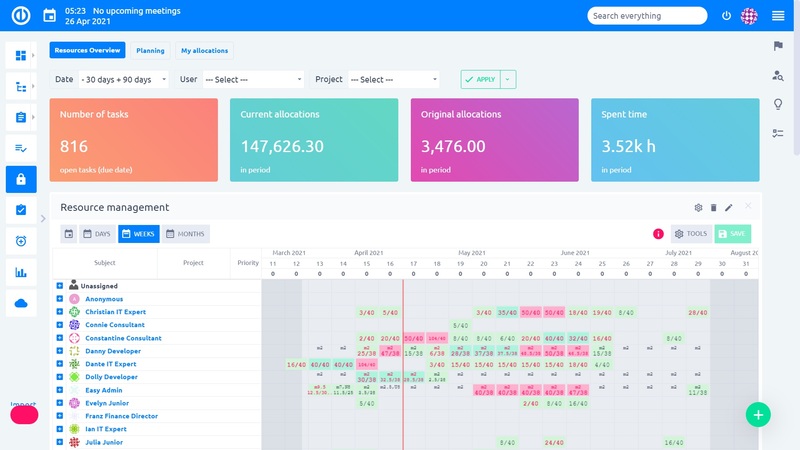 Tracker allocation chart is an overview about estaminated and spent time for all your projects. 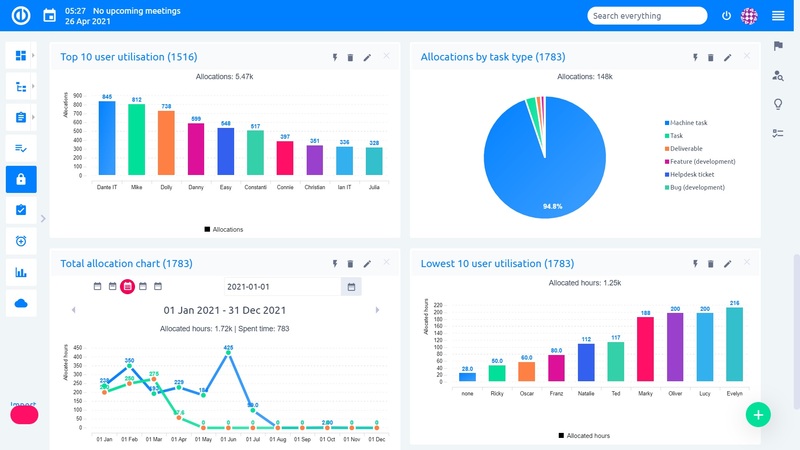 Tracker allocation chart easily monitors what time of tracker takes your team how many hours. Group utilization shows how efficiently resources are being used. Top user utilization shows rankings of the most and least utilized workers. Color, shape, size - all can be easily modified. 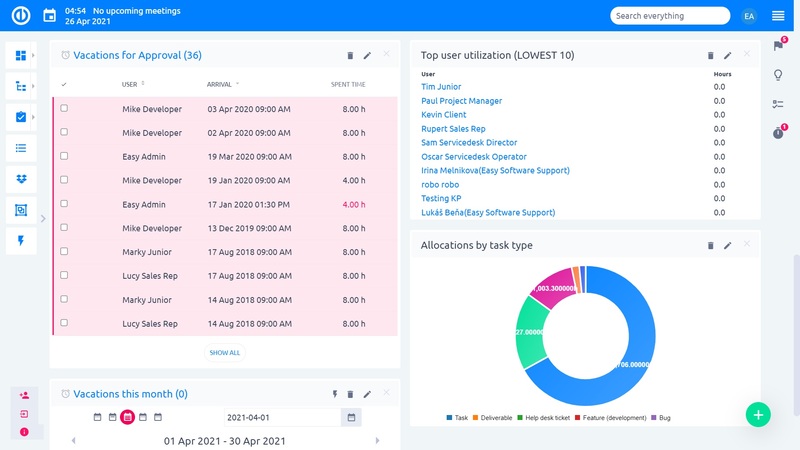 Resource Dashboard plugin is a complement to Redmine Resource management plugin, which helps balance the workload of the people while keeping schedules of the projects. How do users see it? "Easy Redmine met our needs out of the box. The product is feature rich and the price is low compared to products with similar features. We are satisfied with the performance of the product and would not hesitate to choose it again." "We use Easy Redmine to simplify our work in managing projects. We made a few tweaks ourselves to this Open source application but we are overall very satisfied."